There are thousands of slots online, each with various themes and origins, but none feature as historical a character as Queen Cleopatra. Cleopatra was one of Ancient Egypt’s most famous figures and her role has been re-enacted both in films and television shows over the years, but thanks to IGT, she can now be found in the world of online slots. Queen Cleopatra was the last Egyptian pharaoh, until the country became part of the Roman Empire around 48 BC. Some slot games wither away with age, but the Cleopatra slot isn’t one of them. It is still fun to play and has a loyal fan base with players around the world. The Cleopatra slot game resembles many other classic slots in terms of its layout. 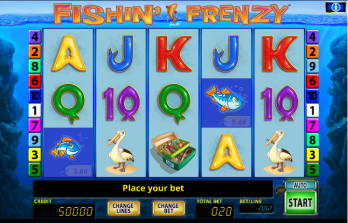 The game has five reels with three rows and up to 20 paylines. The reels are displayed on an interface which is similar to an Egyptian tomb, adorned by hieroglyphics at the top, while the graphics are clear and visually striking. 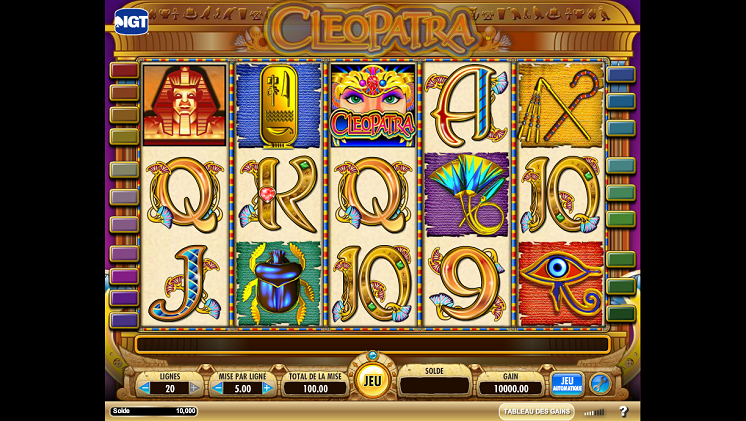 The graphics help to distinguish the Cleopatra slot from other themed games on the market. The brightness, combined with the design really singles out this game as truly unique and fun to play. The game features both lower and higher paying icons, with the lower ones (A,Q,K, J) all displayed in an artistic font. The higher value symbols are Cleopatra herself, Julius Caesar, the blue scarab beetle and the asp, which is an ancestor of a venomous viper, and the snake which bit Cleopatra after Mark Anthony had killed himself, following rumours that Cleopatra had died. 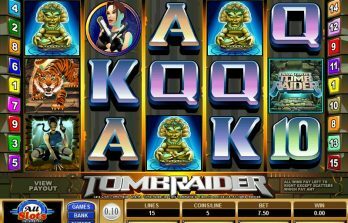 The gameplay for this slot is fast-paced and lively, while the music and soundtrack adds to the intensity of the Cleopatra slot game. Like many other slot games, Cleopatra is easy to understand and simple to play. Players must place a wager, either in credits on demo mode or with real money if playing in the standard version of the game. To set your wager, all you have to do is click on the plus and minus buttons next to the Line Bet button. This will adjust and raise or lower your stakes for this spin of the reels. The value of the coins range from 0.01 to 50 and these can be easily altered by the player before spinning the reels for the first time. As has already been mentioned, there are 20 paylines in the game, but these can also be easily amended to a player’s particular liking. To do this, you simply click on the minus button next to the Lines tab on the toolbar, which will reduce the number available. Once the paylines and wagering limits have been set, all that’s left to do is click on the “Spin” button and the reels will set in motion and you can start winning some jackpots. If you wish to play automatically and uninterrupted, then click on the “Autospin” feature, which will set the reels to spin as many times as you wish. All players, whether veterans or novices are advised to read all the information located in the Paytable, which acts as a help centre for players to understand how to win in this game. The Cleopatra slot features just one wild symbol and that’s the character herself. When she appears on the reels, she’ll replace all other symbols on that line, with the exception of the scatter symbol (the Sphinx) to create a winning combination. The game itself will highlight when this happens, as the Cleopatra symbol will change to “Double”, meaning that it now counts as a multiplier (x2) which in turn doubles your winnings. There is a scatter symbol in the game and it’s almost unmissable, the Sphinx character. The Sphinx was a prominent character in Egyptian culture and it’s just as much so in this slot game. The Sphinx plays a key role in the bonus feature in this game. To trigger the bonus feature, players have to land three or more Sphinx symbols anywhere on the reels. In the bonus game, you’ll win 15 free spins with a multiplier of x3, meaning that every win on the free spins will be trebled! Another hit of three Sphinx symbols on the reels will reward you with another 15 free spins. 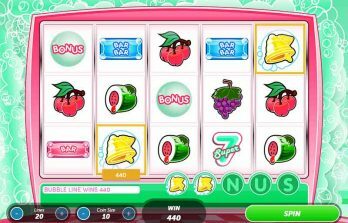 This can continue up to a maximum of 180 free spins, all meaning that this slot game has the potential to bag you some big jackpot winnings at whatever casino you choose to play at.